First, credit where it's due: I read Pilcrow after reading the wonderful reviews of it & Cedilla (which we'll get to in a moment) over at the wonderful book-reviewin' blog Asylum. If you're interested in thoughtful reviews of interesting books on a regular basis, I recommend you keep an eye on that blog. 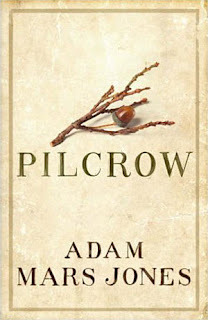 Anyway, Pilcrow is the first book in a (proposed) four-volume novel by British writer Adam Mars-Jones tracking the life of its narra tor, John Cromer. (The aforementioned Cedilla, volume two, was published late last year.) Pilcrow is also the name of the paragraph-break punctuation mark that you're probably familiar with if you've done much of the accursed Track Changes in MS Word. Pilcrow (the novel) begins - after a brief flash-forward to him learning to drive - with John's boyhood in 1950s England. He is a curious (as in, interested) boy, probably fairly typical in a lot of ways for 1950s English children. His father was a pilot in the war, and is emotionally reserved towards his family (again, fairly typically, I suspect, although there are also hints that his nature goes beyond this), and his mother is the dominant figure in his life - something of a snob, perhaps even a social climber. The early sections of the book lay out this life in a low-key way, setting the scene for the change that drives most of the rest of the story: when still quite young (five or thereabouts), John is struck with a rare illness that vastly reduces his mobility. Essentially, he loses all movement in his legs, and most of that in his arms. Confined to his bed, and needing near-constant care from his mother, John's life takes a significant turn. Through the rest of Pilcrow, we follow John up until his mid-to-late teens. He eventually moves from his home to a hospital, where he stays for several years until moving to a school for handicapped children. During that time he undergoes the things that almost everyone does during those ages (emotional and intellectual developments, sexual awakening, struggles with friends and family), plus of course the issues brought on by his near-total immobility. And that's about it, plot-wise. Thankfully, Mars-Jones is interested enough in the premise and characters of his story to not overstuff the plot. Through John's narration (from a later age), he are taken slowly, but always compellingly, through what it might have been like to grow up as John: the narrator's voice is wonderfully done, and the sizeable array of supporting characters are evocatively described. Few of them are as deftly-drawn as John's mother, although some of his schoolmates & teachers are strikingly well-observed (I have a special fondness for the spying/secret agent-obsessed Julian). Rather than an inherently-propulsive plot, what makes Pilcrow such a pleasure to read are the small details: Mars-Jones has clearly spent a lot of time thinking about what John's life would have entailed. And he describes it all in a pitch-perfect voice - while John is perhaps more reflective than the average child, the combination of his reflection-encouraging circumstances and the fact that the book is narrated from later in his life means that Mars-Jones avoids the pitfalls of the rarely not-annoying implausibly brilliant child narrator. Doubtless a 525 page book with a distinct absence of whiz-bang plottery is not for everybody - especially when the book sorta just ends, with three books to come (Cedilla, I should note, is even longer - 700+ pages in hardcover). But those who are willing to delve into John Cromer's life will find much to enjoy, from the consistently sparkling prose and well-imagined characters to the various set pieces throughout. Pilcrow is a novel to move through slowly, not a novel to race through, but neither did it ever feel like a slog. I'm now eager to get (& get into) Cedilla, even though that will still mean a few years (presumably) until the next volume comes out.